Matrix, Inc. has first access to current laser technology and the best pre-owned cosmetic and aesthetic lasers in the world. 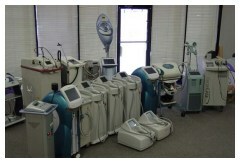 Please review our inventory listed on this page, and notice that we may have exactly the cosmetic or aesthetic laser you are looking for. Matrix, Inc. researches and selects the most recent technology in the field of aesthetic, non-surgical equipment to benefit our clients and our physician clinics. Our criteria include researching systems that require little down time for healing, work on all skin types, and are cost effective.